The gift industry trade shows/markets* normally start off each year with the huge Atlanta International Gift and Home Furnishings Market in early January at The AmericasMart followed by other regional shows across the U.S**. Then in June, the Dallas Total Home & Gift Market starts the summer season of gift shows, followed by the Atlanta show in July. The attendance at the summer shows has ALWAYS been smaller than the winter shows because retailers do not need to restock their inventory with as much merchandise. Most retailers sell at least one third of their merchandise during the Christmas buying season. And, as usual the lower attendance at both the summer Dallas and Atlanta shows transpired. Read below about several of the shows. * Gift industry trade shows are for manufacturers to exhibit their products so that retailers can purchase them for their stores. ** Read "Gift Show Directory for 2014/2015" for the dates and links to websites for gift shows. For me, it does not bode well about the success of a trade show when a report about the show starts out with the optimistic phrase "the mood is upbeat" as editor Caroline Kennedy for Gifts and Decorative Accessories wrote in "Direct from Market: Dallas". She stated that even though buyer traffic was down, business was brisk. And, according to her it's a good sign for the rest of the season. The Gifts and Decorative Accessories (GDA) staff reported in their articles "Direct from Market: Atlanta July 2014", and "Direct from Market: Atlanta, Part 2" a steady flow of buyer traffic at the Atlanta Gift Show (July 8-15) that increased on Thursday and Friday. And, art agent Jim Marcotte reported in his article "Atlanta: Land of Opportunity, or What's Yours Is Mine..." that "We spent 3 long days covering A LOT of those 7M square feet. The doom and gloom of Dallas (see the previous post) was not so evident in Atlanta, perhaps because it’s a better show even on its down days, but traffic was definitely slow." Make sure you read the GDA and Jim’s articles for more information and trends seen at the Atlanta show. And, check out the artist blogs listed below about the show. Also, look at the videos by interior designer Brian Patrick Flynn about AmericasMart to get a feeling on what it is like to walk the Atlanta show when it is busy. Note: Some of the footage for the videos was probably taken during the January 2014 show. artist Caroline Simas: "Atlanta Market July 2014 Recap"
artist Genevieve Gail: "Atlanta Gift Mart Recap"
artist Phyllis Dobbs: "Sights at Atlanta Gift Market"
Brian Patrick Flynn is an American television producer turned interior designer. Also, he is on HGTV and gives presentations during the gift shows at AmericasMart. Brian calls himself an ambassador of AmericasMart. Watch the videos to experience the amazing AmericasMart. "An Interior Designer's Guide to AmericasMart Atlanta"
"Brian Patrick Flynn's Top 10 Tips for Shopping AmericasMart"
The Las Vegas Market is the fastest growing furniture, home decor and gift trade show in the United States. By aggressive marketing and expanding the World Market Center Las Vegas campus, it is becoming the go-to trade show for the Western U.S. states. When this post was written, the July 27 -31 summer show had not yet opened. But the statistics on the expected increase in attendance is VERY impressive. According to the article "IMC: Summer Vegas Market Pre-Registration Gains Over Winter Show" the International Market Centers expects attendance ". . . to gain most abundantly in the gift and home décor category, with buyer registration pacing 18% ahead of the recent Winter 2014 Market and 83% ahead of the Summer 2013 Market." Note: The health of the gift industry ultimately affects art licensing and the amount of art that is licensed by manufacturers. Thus, successful gift shows (Atlanta and other regional ones) bodes well for the licensing industry. Hopefully, this year and in the following years there will be an increase in buyers attending and purchasing merchandise at the gift shows so that the art licensing industry thrives. Art Licensing: Do U.S. artists need a business license to license their art? Questions often asked by United States artists entering the licensing industry is if they need to have a business license or a seller permit to be able to license their art? There are all types of business licenses/permits such as seller's permit, federal and state business licenses, and city/county business licenses. Each is for a particular purpose. Artists that ONLY license their art may not need a business license. It depends upon the city and state they live in. See below for discussions on the different ones. A seller's permit (resale certificate) is needed in most but not all states IF a person sells merchandize at retail (to consumers). The number on the permit issued is called a resale number. Artists who license their work to manufacturers are not selling merchandise at retail so they do not need a seller's permit. And, whether artists who sell to consumers needs a seller's permit or not depends upon the state. Alaska, Delaware, Montana, New Hampshire, and Oregon do not collect sales tax so a seller's permit is not needed when artists sell their work to consumers in those states. To find out information about seller's permits in the different states, go to the U.S. Small Business Administration website. Hint: Artists are not listed as a business type so use General Licensing. And, to find out more about resale certificates, read "What is a Resale Certificate And Who Can Use One?" According to Nolo "Despite what you sometimes hear . . . some Internet sales are subject to sales tax, and even when a site doesn't collect sales tax, consumers are technically responsible for remitting any unpaid sales tax on online purchases directly to their state." Also, " If an online retailer has a physical presence in a particular state, such as a store, business office, or warehouse, it must collect sales tax from customers in that state. If a business does not have a physical presence in a state, it is not required to collect sales tax for sales into that state." For more information, read "Sales Tac on the Internet". A person only needs a federal business license if their business is regulated by a federal agency such as alcoholic beverages, agriculture, aviation, etc as shown in "Federal Licenses & Permits". Since art is not regulated by a federal agency, a federal business license is not needed to license art. Note: Artists may be requested to supply their federal number to a licensee so that they can report the revenue the artist received to the federal and state tax boards. In that case, the federal number is the artist's social security number. NOTE: Artist Kiffanie Stahle shared the following information. "One note on the federal tax ID number issue. Even sole proprietors can request a free employer identification number (federal tax ID number) from the IRS to give to licensees. Licensees will then use this number on your 1099s and the IRS will link it to your individual tax return. Thus keeping your SSN a little safer! Here's the link to obtain an EIN: https://sa.www4.irs.gov/modiein/individual/index.jsp "
Whether an artist needs a state business license or permit depends on the state she/he lives in. Some states require any business operating in the state to register for tax-specific licenses/permits whether based in a commercial location or out of the home. Other states may not require any license/permit. 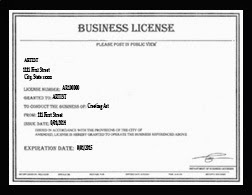 To find out what business licenses are required in your state, read "Find Business Licenses & permits". The requirements in operating a business with employees is more complicated because the owner probably will need to file for additional permits and file forms such as employer identification number, registration of employees, business income tax statements, etc. Also they must comply with laws on minimum wages, hours, working conditions, safety, discrimination, etc. To find out information about the requirements in different states when having employees, go to the U.S. Small Business Administration website. It is not required but some artists decide to form a limited liability company (LLC) to protect their personal finances if their art licensing business is sued for copyright infringement or breach of contract. To do so, it must be filed with the Secretary of State's Office in the state the business is operating in. If the business is a sole proprietorship, it does not need to be registered with the state. Note: Many states require a sole proprietor to use their own name for the business name unless they formally file another name as a trade name, or fictitious name. For more information, read "Register With State Agencies". Most states, but not all, require that the owner of a business register a fictitious business name. In some states the business name could be considered fictitious even if additional word (s) are added to a surname while other states do not consider it fictitious as long as the surname is in the business name. Filing a fictitious name often involves publishing in a general circulation newspaper the opening of the business with the fictitious name. Note: Unless the fictitious business name is filed, bank accounts with the fictitious business name cannot be opened. For more information, look at your states requirements on fictitious business names. For more information, read "Register Your Business Name". Some counties and/or cities require any business operating within their limits to take out a business license even if the state does not necessitate one. The license usually requires a yearly flat fee or may depend upon the gross amount earned. If the business is home based, it may require a zoning variance with stipulations on not allowing customers to visit or employees to work on the premises. To find out information about city/county licenses in the different states, go to the U.S. Small Business Administration website. For artists that have a thriving art licensing business, know that they need to report the income earned to the IRS. Also, they know to report income to their state unless they live in Alaska, Florida, Nevada, New Hampshire*, South Dakota, Tennessee*, Texas, Washington, Wyoming. But artists that have just started licensing their work may not be aware that ANY income earned no matter how little may need to be reported to the state and MUST be reported to the Internal Revenue Service (IRS). According to IRS "It is a common misconception that if a taxpayer does not receive a Form 1099-MISC or if the income is under $600 per payer, the income is not taxable. There is no minimum amount that a taxpayer may exclude from gross income. . . Taxpayers must report all income from any source and any country unless it is explicitly exempt under the U.S. tax code. There may be taxable income from certain transactions even if no money changes hands." For more information about reporting income to the IRS read, "Reporting Miscellaneous Income". And, read "States Without an Income Tax" for more information. * Must pay interest and dividend income.